The Serenity Fun City is set in a splendid location in Makadi Bay, on the banks of the Red Sea, Hurghada, Egypt. 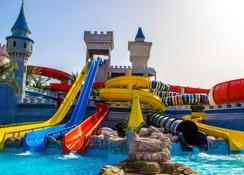 This fun-loving hotel comprises its very own aqua park with an amusement centre, where guests can enjoy a splash-filled holiday with family, friends or a loved one. The sandy Serenity Makadi beach is just opposite the hotel, where you can relax on the golden sands or get involved in diving, snorkelling and boat trips – a popular pastime in the Red Sea. Serenity Fun City features 711 spacious guest rooms and suites, with luxurious furnishings and the option of a balcony or terrace. When you’re not lazing on the beach, the hotel’s lively sports and games facilities are sure to keep guests entertained, with swimming pools, crazy rivers and wave pools at the Aqua Park, plus a slower-paced health club, complete with a gym, sauna, steam room, beauty salon and more. Families will be in their element thanks to the full animation team on hand to organise fun games, events and competitions across the complex. 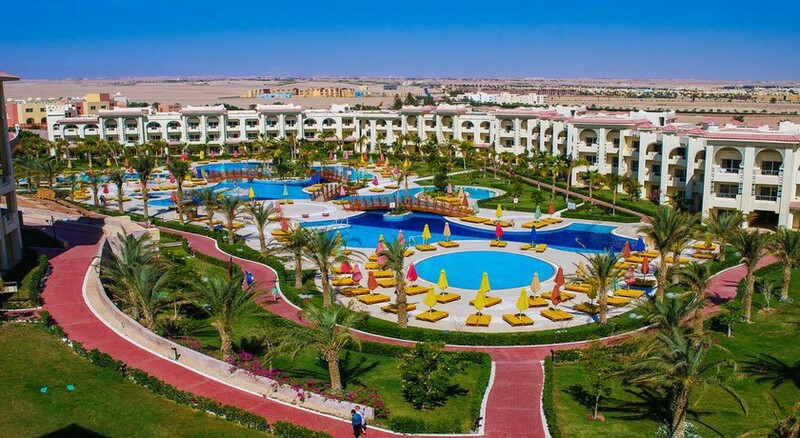 Serenity Fun City is a beachfront resort in Makadi Bay, Hurghada. Set along the banks of the magnificent Red Sea, those who enjoy scuba diving, watersports and boat trips will be in for a treat, as there are plenty of diving centers nearby including Scuba World Divers and the iDive Diving Centre. The airport is easily accessible from the hotel as it is only 36km away. The hotel has 771 luxurious guest rooms, featuring a large terrace or balcony, TV, hairdryer, mini fridge, a stylish bathroom and kitchen amenities. For families or large groups, connecting rooms are available upon request. All of the rooms provide a spectacular view of the beach in Serenity Makadi – bliss. When it comes to gastronomy, the hotel offers exceptional variety wiith dishes to suit all tastes. A complimentary breakfast is provided to the guests from 7am to 10am every day in the main buffet restaurant. If you wish to dine al fresco, there is a tasty food court with umbrellas under the sun, where the guests can enjoy both international and local cuisine with magnificent view of the large outdoor pool. Or for something a little more fancy, there are four fabulous on-site restaurants featuring Italian, Eastern and Oriental fare - plus a convenient snack bar. Guests can enjoy plenty of drinks at one of the bars and a poolside bar too, which are open late. There are many family-friendly facilities at Serenity Fun City that include three outdoor pools, a gym, spa, children’s club, children’s pool, outdoor tennis courts, on-site playground, game room/arcade and supervised children’s activities. 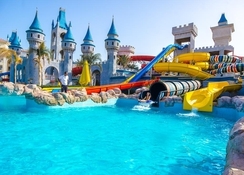 One of the main attractions is the Serenity Aqua Water Kingdom, which is open every day. The fun doesn’t stop in the evening, with international and oriental dance shows and in-house entertainment to enjoy. 3) Double Pool: Duration 3 Weeks and Starts at 20-Nov-18 and Finish at 10-Dec-18. 4) Triple Pool: Duration 3 Weeks and Starts at 10-Dec-18 and Finish at 30-Dec-18. 5&6) Section 1 of Main Pool & Kids Pool: Duration 3 Weeks and Starts at 10-Jan-19 and Finish at 31-Jan-19. 7) Section 2 Main Pool: Duration 6 Weeks and Starts at 1-Feb-19 and Finish at 15-Mar-19. 8) Mini Aqua: Duration 3 Weeks and Starts at 10-Feb-19 and Finish at 28-Feb-19. 9) Wave Pool: Duration 4 Weeks and Starts at 1-May-19 and Finish at 30-May-19. Perfect family resort for a memorable holiday!! I was surprised by the hotel !!! New GM does his best! Good food and fruits, not big choice but it is really nice! Fantastic aqua park with "crazy" river ride. Proper trained hotel staff in clean uniform. No complains about quality and cleanness of the room. Fantastic reef.